UNLV won just 11 games in the first season of the Marvin Menzies era. After grinding out an 89-82 foul-fest over Illinois on Saturday night at the MGM Grand Arena, there’s an excellent chance the Runnin’ Rebels can match that total BEFORE the team starts Mountain West play on Dec. 30 against Boise State. Senior guard Jovan Mooring scored a game-high 27 points, including a pair of key 3-pointers during a late 16-8 spurt, to lead UNLV (8-2) to its second win over a Power Five conference team this season. The Runnin’ Rebels also crushed Utah, 85-58, back on Nov. 22 at T-Mobile Arena. Consider this: the Runnin’ Rebels are a pair of tightly-contested overtime losses at Northern Iowa and Pac-12 favorite Arizona – two teams that figure to be NCAA Tourney bound come March — from being unbeaten and going potentially 13-0 in nonconference play. UNLV now has a week off before playing at Pacific (5-6). The Runnin’ Rebels then finish up nonconference play with home games against winless Mississippi Valley State (0-8) and Northern Colorado (6-3). The Runnin’ Rebels don’t figure to lose anybody again if they can continue to mount the huge advantages in free throws they had in Saturday night’s win over the Illini (7-4). 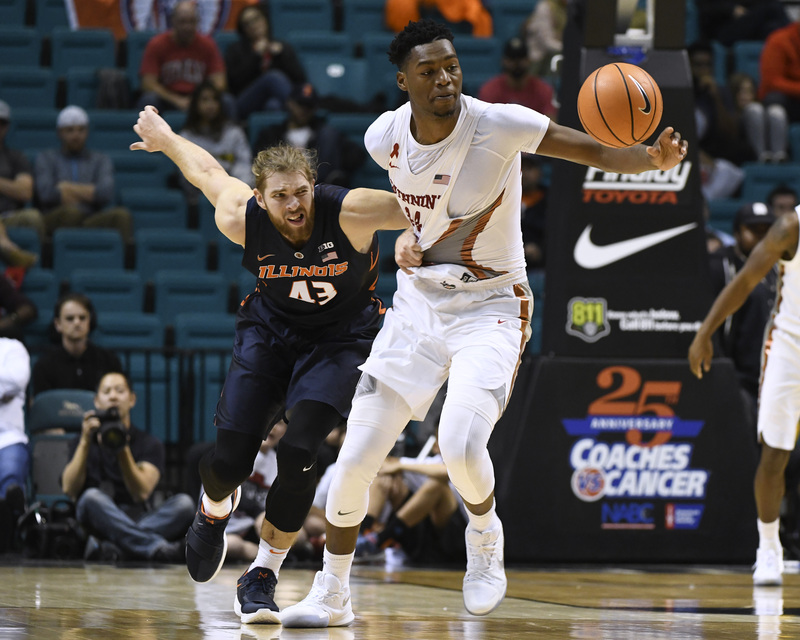 During one moment early in the second half, Illinois had been whistled for 30 fouls compared to just nine for UNLV. 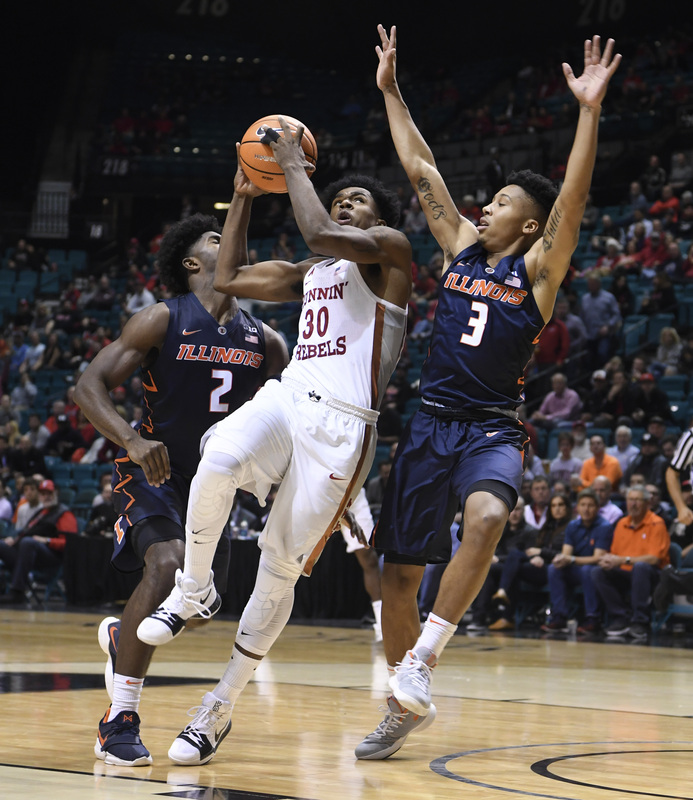 The Runnin’ Rebels attempted 48 free throws, making 33 (68.8 percent), while Illinois finished just 11-of-15 at the free throw line. That’s plus-22 in made free throws for UNLV. Mooring, who finished 14-of-18 at the line, attempted three more foul shots than Illinois’ entire team. Freshman center Brandon McCoy finished with 22 points, 10 rebounds, three blocks and two steals, his seventh double-double of the season. KEY PLAYER: UNLV guard Jovan Mooring scored a game-high 27 points, including nine during a late 16-8 spurt that expanded the Runnin’ Rebels lead to 10 points. Mooring finished 5-of-10 from the floor, including 3-of-6 from 3-point range, and sank 14-of-18 free throws, the most free throws attempted and made by a UNLV player this season. “I think the officials were calling it tight on both ends. Both teams like to get up into each other and pressure the ball. We knew how much they reach and they try and stand up on the ball and get steals so they can get out in transition. Taking care of the ball was a big thing coming into this game.” – UNLV guard Jovan Mooring, who had a game-high 27 points, including 14-of-18 free throws, and also added three assists and zero turnovers in 37 minutes. “They called it tight and rightfully so. … We had an experienced crew and they called what they saw. Most of them were correct I imagine. They don’t care who wins. It worked out for us in our favor tonight. … No, I don’t think I’ve ever been involved in a game with that many free throws.” – UNLV coach Marvin Menzies after the Runnin’ Rebels finished 33-of-48 at the free throw line, outscoring Illinois (11-of-15) by 22 points at the free throw line. UP NEXT:The Runnin’ Rebels travel to old Big West rival Pacific on Saturday night at 7 p.m. 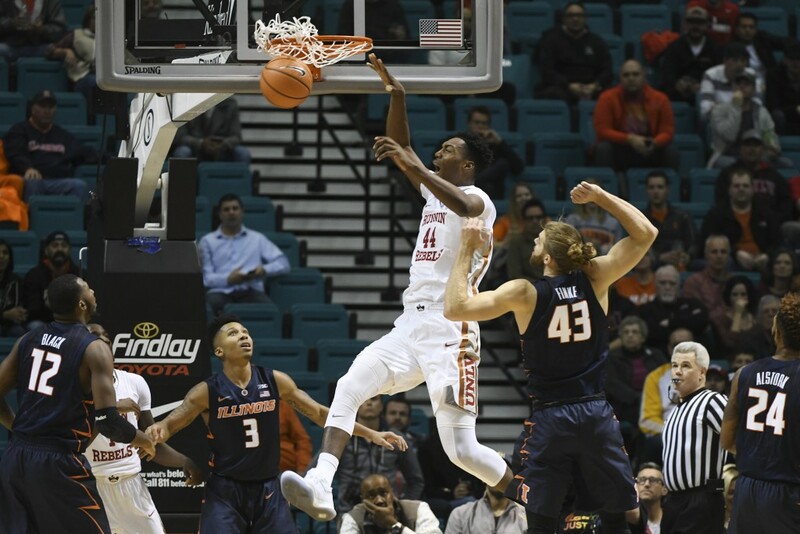 The Tigers, who now play in the West Coast Conference, lost at Wyoming, 86-72, on Saturday and have a video specialist very familiar to UNLV basketball fans – Justin Hawkins. NOTABLE: UNLV opened the game by hitting its first six shots en route to a 14-4 lead and shot 52.0 percent (26-of-50) for the game. It marked the eighth time this season the Runnin’ Rebels shot 50 percent or better from the floor. … Illinois, which had 25 turnovers in a 64-57 home win over Austin Peay on Wednesday, had 16 more on Saturday night. … The Runnin’(?) Rebels were credited with zero fast break points while Illinois had just two. 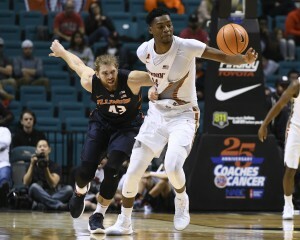 … The Illini, who had two players foul out and five others wind up with four fouls, finished with a 44-18 edge in bench points. … The game featured eight lead changes and seven ties but UNLV led for 32:27. … The Runnin’ Rebels rank fourth nationally in scoring offense (91.5). … McCoy is tied for fifth nationally in double-doubles (7), four behind leader Jordan Murphy (11) of Minnesota. … The 36 fouls by Illinois were a season high for a UNLV opponent, four more than Prairie View A&M on Nov. 15. … The 48 free throw attempts were a season high for the Runnin’ Rebels, 10 more than they attempted against Prairie View A&M. … UNLV now ranks third in the nation in free throw attempts (288) behind only Minnesota (11, 296) and Duke (12, 291), both of which have played more games.